It’s been a long winter, with spring growth noticeably later than in recent years. So we were no doubt all glad to see daffodils in flower at last on the grassy banks of the bar walls. Seasonal colour is also traditionally injected into the city centre environment in the form of bedding plants in flowerbeds, hanging baskets and tubs. 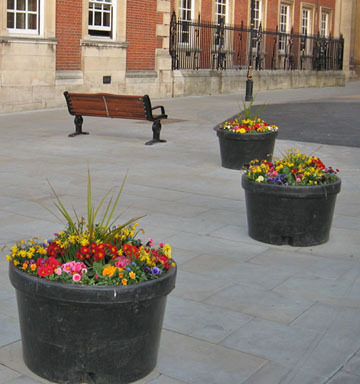 The tubs pictured are new additions, on the repaved area near West Offices (new home for City of York Council) and the Cedar Court Grand Hotel (visible in the background, used to be railway offices). This area has had a makeover not only in its paving but with benches and these tubs dotted across it. I’m not sure about the black plastic, but then we’ve got no money left so can’t expect carefully crafted ironwork, like the Victorians might have made. I wonder why we still see floral displays like this as important, in the 21st century, and why we spend money on them still when so many more important things are being cut back. I can’t imagine they’re of much use to wildlife, which tends to avoid the city centre. Passing bees, should there be any on Station Rise, perhaps prefer the more natural ‘cottage garden’ type of flowers. But of course these floral displays aren’t for wildlife – though god knows it needs our help – they’re for visitors mainly. Almost entirely, probably. It’s just a thing cities do, plant up containers with cheery flowers. It’s virtually compulsory I think. Beyond the historic core the approach to seasonal growth has looked more like this in various locations. 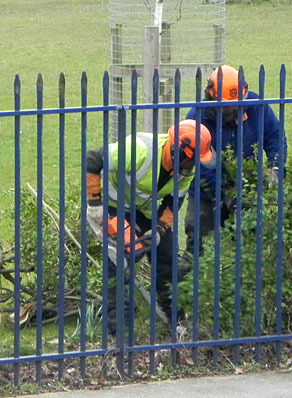 Contractors with chainsaws removing hedges and shrubbery. Pictured here at the boundary of Hull Road Park. Thanks to Carl Shilleto for the photo. 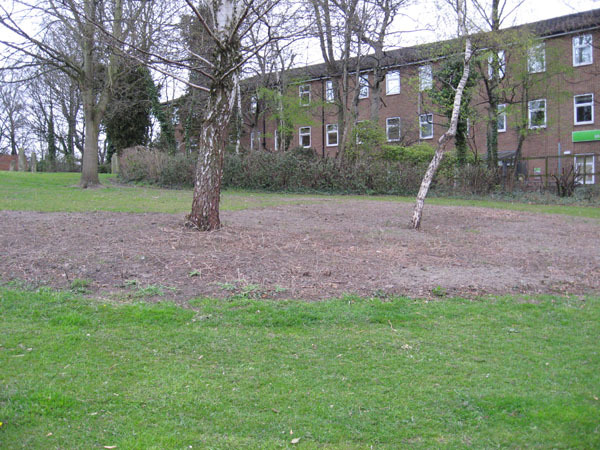 Similar hedge removal has taken place on Bootham, and there’s been clearance of much of the shrubbery on the green area just outside Monk Bar, where St Maurice’s church used to be and where its old graveyard still is. It isn’t entirely clear why so much greenery has been so brutally uprooted. To save on maintenance costs? In the case of the short stretch of hedge on Bootham (opposite the Sainsbury’s Local) it makes sense. It was a rather pointless hedge in a rather pointless bit of ‘garden’, and no one’s missed it as far as I’m aware. Not the case with other greenery removed. Residents near the Hull Road Park have been campaigning against the hedge clearance. The green area at the top of Monkgate, pictured recently, 22 April. Google’s Street View captured it last May: compare and contrast. Obviously the Google image is a month later in the spring, so there’s much more growth, but there’s not much chance of this looking so green this May. Or in any May for years to come. Much of the shrubbery seems to have been completely removed, dug out. In this case, it’s can’t be to save on ‘maintenance costs’ – ie regular trimming. If shrubbery is away from the pavements, on a little-used lawned area, there’s no need to prune it, as it doesn’t obstruct anything. I did learn something recently about the modern day use of this shrubbery-covered area, from looking at it and reading about it. Looking at it, when compiling an earlier page, I noticed a lot of empty cider and lager cans. Reading about it later I learned that it’s a well-used site, and that the cover provided by those shrubs has been appreciated as shelter. So perhaps that’s something to do with the removal. If it has been removed to stop homeless people sleeping here, or to deter people from surreptitiously drinking cider behind it … well, words fail me and I’ll perhaps return to the subject later. So, back to Hull Road Park. 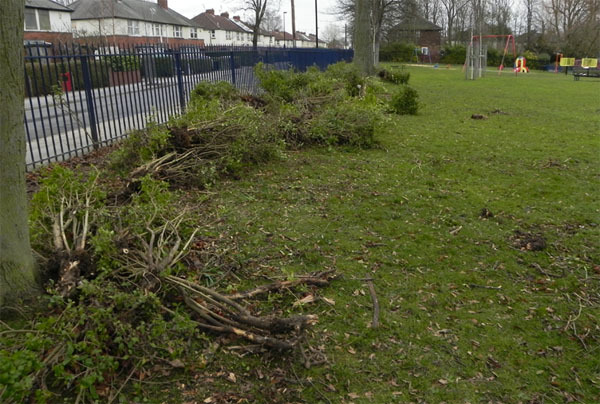 Residents noticed that the hedges at its edge were being destroyed, and have asked why. I hear a lot about how the council wants to encourage community engagement, and here was an example of that. Residents emailed councillors and campaigned on Twitter and got coverage in the local press. They’re just small details in the local landscape, aren’t they, bits of shrubbery, hedges. But that doesn’t mean they’re not important. They’re also perhaps symbolising a bigger thing, as small things often do. We have the York within the walls, and the York beyond the walls. Most of us live beyond them. So much attention is focussed within the walls, so much money spent there. For example, on seasonal displays in tubs on streets not frequented by insects or any other wildlife, and perhaps, increasingly, not frequented by the majority of residents either. Beyond the walls – it seems it doesn’t matter about the greenery. Trees are pruned to ugly stumps and hedges are ripped up. As long as the roundabouts on the approaches have bedding plants to impress our all-important visitors. Welcome to York. By Lisa @YorkStories • 30 April 2013 Green places, Opinions, thoughts To link to this page's proper location please use the > permalink.